Our warehouse in New Jersey is fully stocked with our newest keyboard - Optimus Popularis. Incredibly complex mechanics, many years in production, but we made it. We are the only design studio in Russia that does something. BTW, Optimus Popularis (http://www.artlebedev.com/everything/optimus/popularis/) is being mass produced but shipping is slow because we fine tune every unit's mechanics. If you've ordered one, expect it soon. 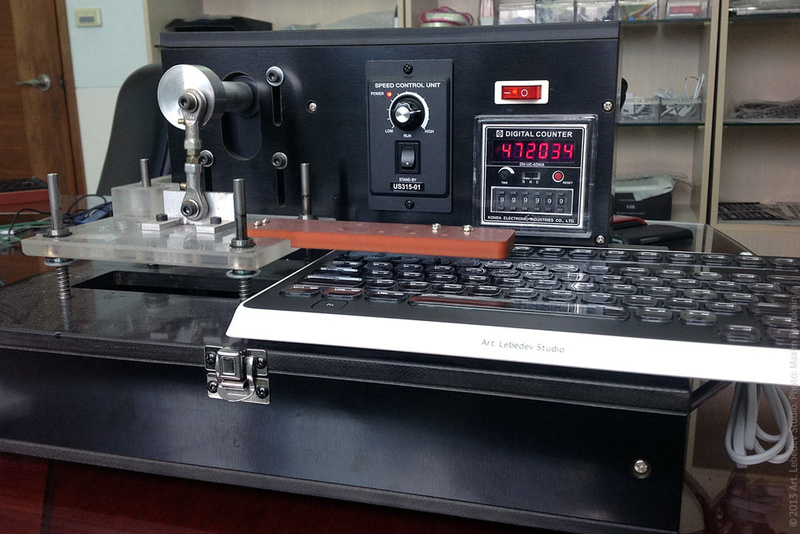 Finally production of our newest keyboard model - Optimus Popularis - has started. It takes three hours to cut one aluminum frame for the keys. Machines work 24/7. First keyboards to be shipped before the New Year. We're back on track with the production of our Optimus Popularis keyboard. Now testing number of keypresses on one of the very first assembled models. Popularis is not just an ordinary mechanical keyboard. It has extremely sophisticated, but unnoticeable and hidden mechanics for every key. Thanks for everyone who came to see us and our keyboard! To all the skeptics who say that we delay shipping of Popularis, may I remind that none of the multi-million-dollar Western companies could deliver anything close to what we do (just lame 3D concepts). And we are just a design studio in Moscow. Yes, we are the most successful design studio in Russia. But we don't pump oil, our business is design, we are still in Moscow, and all the money we spend on production is not from investors. So plus-minus one year makes no difference in the reality we live in. Anyway, Optimus Popularis will be shipped this year. Electronics are ready, moulds are done, mass production is about to start. Come and see the real thing in action. We’re at South Hall, upper level, booth #35603. 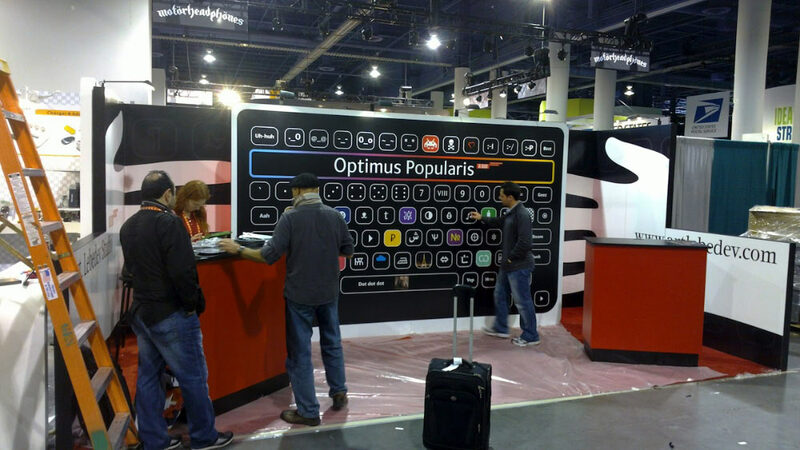 You are invited to explore our real Optimus Popularis keyboards at 2013 International CES (January 8 through 11, 2013 in Las Vegas). We’ll see you at South Hall, upper level, booth #35603. Some videos from the recent professional show called NAB with our line of production and prototype keyboard models. Visit us at 2012 International CES (January 10 through 13, 2012 in Las Vegas). We're at the Venetian Ballroom, level 2, booth #70621. First of the new keyboards to be released is Optimus Popularis. It has the size and the feel of the best notebooks, but every key can be programmed to show (or do) anything. Shipping in June 2012. Optimus mini six has the same key size but only 6 buttons. Shipping in November 2012. Optimus Aux uses the same keys as Optimus Maximus (but only 15 of them). Shipping in November 2012. Visit us @ 2012 International CES (January 10 through 13, 2012 in Las Vegas). We'll be at the Venetian Ballroom, level 2, booth #70621. Visit us at the world's largest consumer technology tradeshow - 2012 International CES - January 10 through 13, 2012 in Las Vegas. We'll be at the Venetian Ballroom, level 2, booth #70621. See the new Optimus keyboard prototypes and pre-production models. 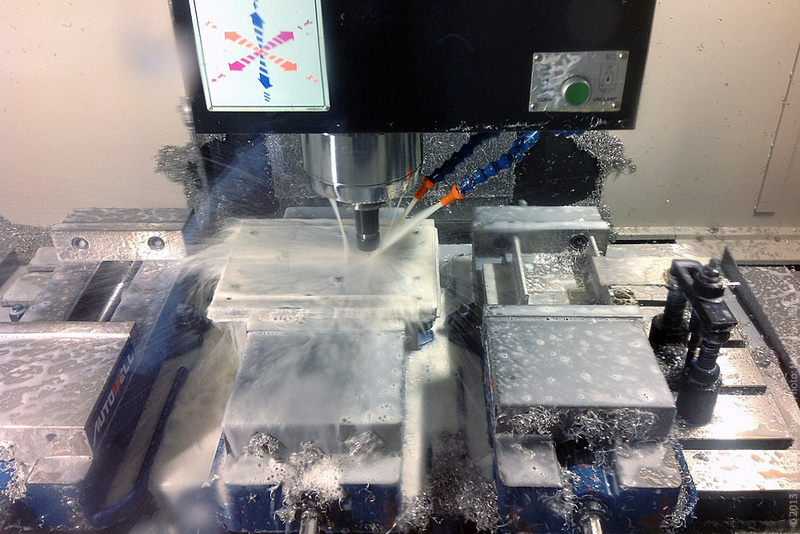 Our newest addition to the Optimus family is in the early production stage now. We plan to release it later this year with the full-sized Optimus Popularis coming in 2012. Unfortunately, recent financial crisis influenced our production plans. Optimus Popularis is delayed for this very reason. Now everything is more or less predictable, so we're going to develop new products this year. If you remember, before releasing our flagship Optimus Maximus, we designed proof-of-concept model called mini three (which was a success on its own). This year, before the release of our new dream - Optimus Popularis - we'll release the smaller version based on the same technology as a big model. Currently it is called Optimus Mini Six. There will be six display keys, as one may guess. Ladies and Gentlemen, here's our newest display keyboard - the Optimus Popularis. We expect it to ship at the end of this year / beginning of next year for less than 1000 $ with pre-orders starting sometime later this year. Now every key - even the space key - has as much screen real estate as possible. There's also additional screen area between F-row and the rest of the keys. Optimus Popularis comes in compact form-factor without the dedicated numeric keypad section. We have special Fn key in the lower left corner that turns right part of keyboard into the page-up and num-lock keys, as well as the numbers arranged in a familiar calculator layout. As usual, all the project details will be published here. I'm open for all comments and can be reached at tema@tema.ru. Gray indicates inactive zone. As you may note, Popularis' standard key is smaller, making it much easier to type. It's amasing how much can change in three years when we speak about technology. New Optimus is going to be thinner, faster and simpler for less. After the global economic turndown we're still alive and full of plans. We're working on a new Optimus Popularis keyboard and hope to start production later this year (with the release likely in 2011). Optimus Popularis' keys will be full-color, but not OLED this time. Details and images to be published in June. One of the many usages for Optimus Maximus keyboard is nicely demonstrated in this video.